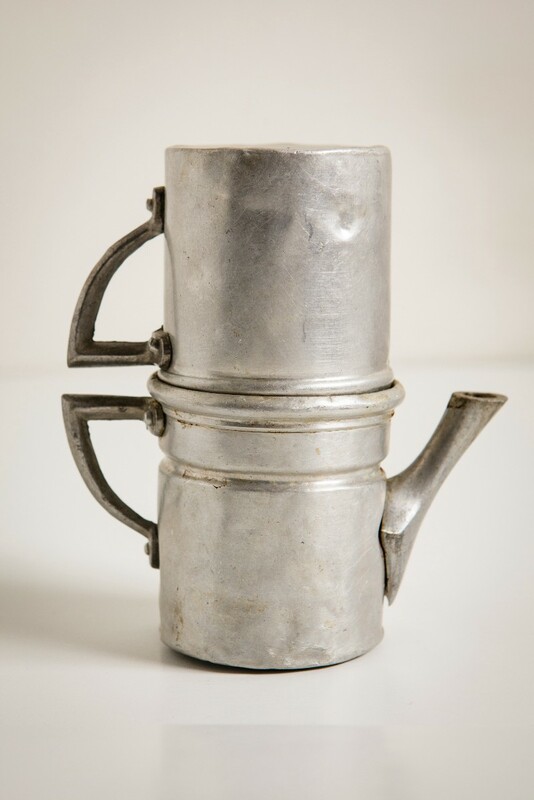 My grandmother’s coffee pot, photo by Chris Leary. For all I know, it might actually have belonged to my great-grandmother, Giuseppina, a rock of a woman who brought her two younger kids over from Italy to track down her husband, who met them at the boat then disappeared again. (There’s more to that story, I’m sure.) You see how the tarnish on it, the bangs and dents, the sense of a history, make it so very much more beautiful. Of course, that’s not my only caffettiera (more specifically, una napoletana). This one — for a single serving of espresso — also came down to me through my mother, but from whom, I’m not sure — I never saw my grandmother using it. She never made coffee just for herself. Maybe Giuseppina did. Maybe she, who crossed the ocean alone with two kids, depended on that one luxury. Or maybe my mother used it as a Jackie-O-stylish young divorcee in the 60s, on her own but still attached to her roots. 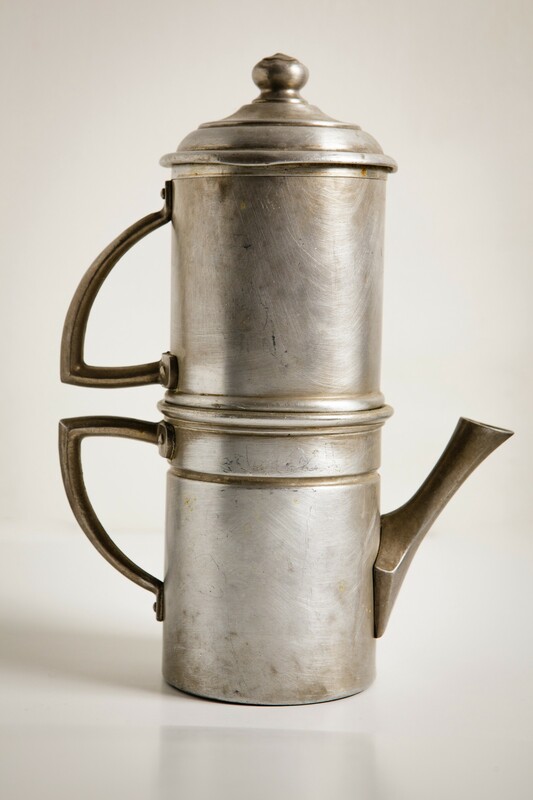 My colleague Stephanie Romeo — fabulous woman, we’ve worked in the same company for years but only really met at the pre-Columbus Day celebration of Italian Americans at Gracie Mansion this fall, and because of Maria Laurino’s book, THE ITALIAN AMERICANS — gave me this photo of her great-grandmother’s coffee pot, still used by her mother. (There’s an adorable picture of Stephanie’s grandma and great-grandma in their house dresses in 1960s Bensonhurst in the book, and her great-great-grandma’s Enemy Alien card; a few of my own family pix and documents are there too. 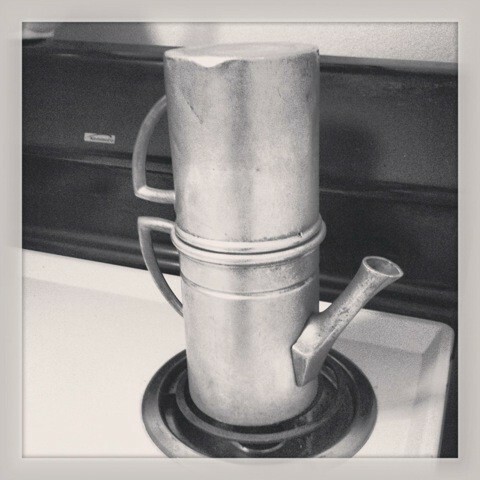 The photo of my grandmother’s coffee pot at the top of this thread opens Part I of THE ITALIAN AMERICANS.) This newish pot at left was given to Stephanie by her sister. This is the pot I usually use. It’s cleaner than this now; I was embarrassed I’d let it be photographed this way (by photographer Chris Leary). The bottom of the handle is a little melted because I am usually impatient and put the heat up too high. Which of course also risks the coffee boiling in the top and becoming bitter. It’s a risk I’m willing to take. I’m also not scientific about the amount of coffee I put in. I like not knowing exactly how my espresso will turn out. It makes it so much more satisfying when I get it right. 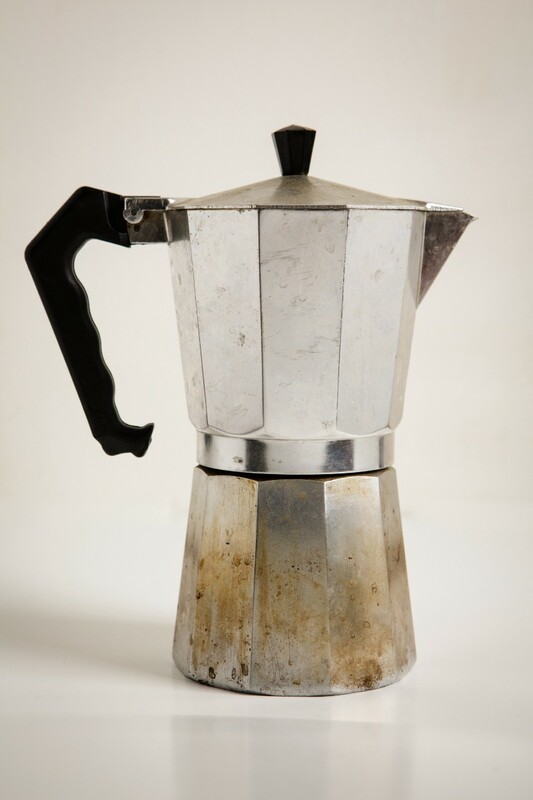 I asked my distant cousins in Naples to send me a picture of their coffee pot, since I didn’t think to photograph it when they came to New York. 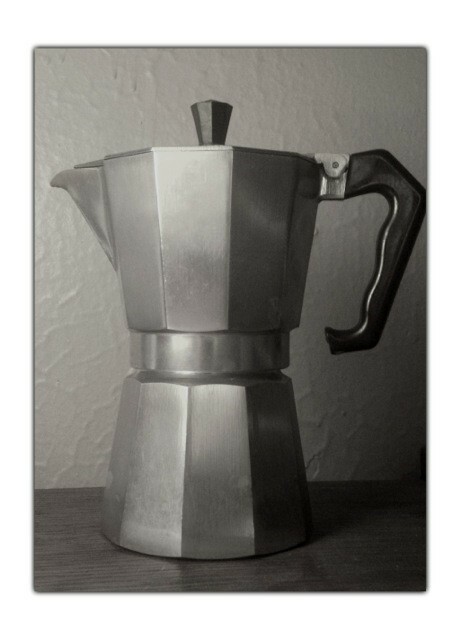 Yes, they brought their own caffettiera with them, 4,400 miles. They take it everywhere they travel, along with a bag of Kimbo, the Neapolitan brand. After all, as Gennaro says, coffee from the street or a bar will give you ulcers. Only coffee from home is good for the stomach. He showed me how to prepare it: you don’t just fill the filter crater, you make a mountain “come Vesuvio!” You tap that down with a spoon, and add more, then use the motion of screwing down the top to pressurize the grounds. If it comes out thick as ink, that’s un caffe ottimo. Anything less is really flavored water. So maybe I don’t need to tell you what happened when my British parents-in-law gave me a fancy Nespresso machine, to make a perfect, predictable, just-right-foam-on-top serving size of coffee each time, from those airtight, freeze-dried, plastic pods. I explained that we sadly didn’t have room on our cramped kitchen counter, so she took it home, where it blew up from electrical circuit incompatibility.